Here we grow again! As a result of our firm’s recent expansion, we are adding to our senior leadership team to prepare for future scalable growth. As an employee-owned firm, we have always prided ourselves on recruiting and retaining top talent and are excited to announce the posting of these opportunities at the firm. View our full list of opportunities. The Cordish Companies’ flagship Live! Hotel in Hanover, Maryland has been awarded the top retail / hospitality project by the Baltimore Business Journal! The building has an all-glass tower with a sloped facade that juts out eight feet further west than its foundation. The project’s innovative design increased building functionality while creating a stunning exterior. Congratulations to our client The Cordish Companies on this prestigious award! Looking to make a career move? We are looking for a staff highway engineer with project management experience and in-depth background in the design of highways and roads to join our team at our Woodcliff Lake, NJ or New York, NY office! This candidate will be responsible for supervising staff, performing all facets of highway engineering, monitoring budgets, assisting in preparing proposals, and more. Learn more or to apply for this position. McLaren helped engineer part of 3DEN, the newest co-working space now open in New York City’s Hudson Yards. Our NYC and Florida offices worked together to provide retail fit-out engineering for this nature-infused, pay-as-you use respite. The space features comfy chairs, tree swings, nooks to focus, private showers, and nap pods to recharge members! McLaren was pleased to provide structural engineering services for the interior of this space, designing interior wall framing, green wall framing, the entry door portal, tree swing anchors, and custom perforated metal ceiling anchors and hangers. The 16th annual Lower Hudson Valley Engineering Expo for middle and high school students was a great success! This hands-on, interactive event had countless learning opportunities about the diverse field of engineering and what it offers. We were pleased to be one of the organizers for this impactful event that featured thousands of attendees and hundreds of exhibitors! Did you know that McLaren worked on the world’s largest and tallest dormitory built to Passive House energy standards? ‘The House’, is part of Cornell Tech’s new 12-acre technology campus on Roosevelt Island in New York City. The McLaren team supported the structural design of the windows and reviewed shop drawings for the installation of a customized Schüco punched window system. Our glass and glazing team was pleased to coordinate with a variety of project partners to help bring this impressive 26-story energy-efficient building to completion. McLaren is excited to be sponsoring Woodcliff Lake, New Jersey’s 33rd Annual Run for Education on June 9, 2019! The event will include a 5K, 10K, a kids fun-run, vendors and various activities like a dunk tank. All proceeds from this annual event go directly back to local schools. Are you looking to join a collaborative team, where you will engage in creative and critical projects? We are looking for a Project Engineer to join our dynamic Marine Division team in NJ or NYC! Our ideal candidate will take initiative, be a licensed PE and have at least five years of experience. Apply today! Live! Casino & Hotel Philadelphia is officially on its way up! McLaren is providing structural and site/civil engineering for this world class gaming and entertainment facility. 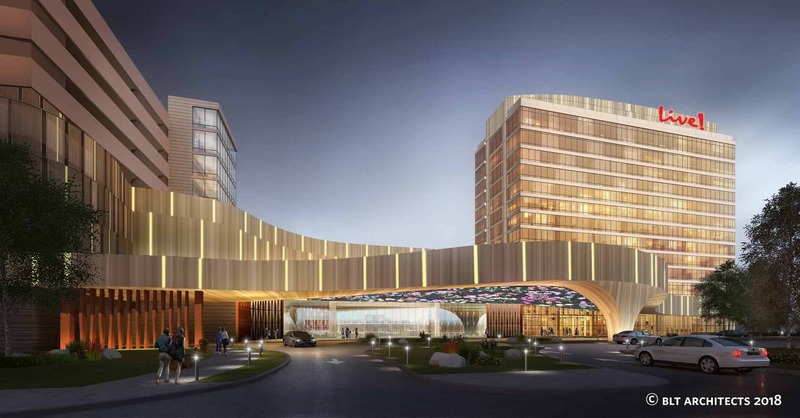 The development will contain almost 1.5 million square feet of space, consisting of a hotel, a casino, restaurants, a live entertainment venue, a parking garage and numerous other amenities. The project involved razing the existing hotel tower and constructing a new facility in its place. McLaren developed a ground improvement plan to enable the hotel and casino to be founded on shallow foundations, which resulted in $1.5 million in savings. This $700 million hotel and casino are expected to be completely finished in 2021. Meet you in St. Louis! McLaren will be speaking and moderating on the Design & Analysis Track at this year’s NASCC: The Steel Conference, April 3rd through 5th. Speakers: Thomas Murray, PE, PhD, Virginia Tech; Brad Davis, University of Kentucky. Human-induced vibration is an important limit state for ﬂoors, stairs, and other structures. This session will address the most common questions and misconceptions about structural vibration serviceability. It will also answer questions about the updated evaluation methods for sensitive equipment and several other applications featured in the second edition of Design Guide 11. Exhibiting: Come visit us at booth 1438!